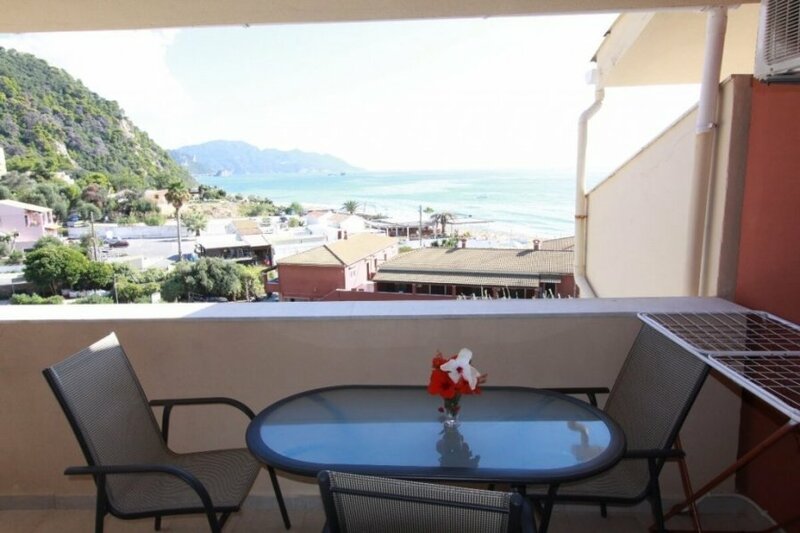 Located in one of the most beautiful sandy beaches of Corfu ..
With an amazing sea view.. In our coco-mat apartment AA5R 155 you will feel like in your second home .. Apartment with 3 layer sleep system of the famous for sleep quality Coco mat bed, the apartments are 38 sq.m, consists of 1 double or twin bedroom with high quality bedlinen 100% cotton and pillows (1 pillow Morfeas and one pillow Narkisos per person), living room with one double sofa bed, new fully equipped kitchen incl. big refrigerator, coffee-machine, ceramic cooker, oven, WC/shower, air-conditioning in both rooms, Sat- Flat TV, free WiFi internet access, parking and big balcony with nice sea view. Mini market, restaurant, bar, share swimming-pool in about 100m away. Free WiFi in all resort areas and on the beach, we are not responsible, if of technical reasons sometimes does not work properly. Bus terminal in about 250 meters away. Cleaning 3x times a week. The above rates include 3x weekly cleaning with towels change, once weekly bed linen change, full air-conditioning, SAT- FLAT TV, WiFi, parking, share pool and all the local taxes. In one of the most beautiful sandy beaches of Corfu , with a crystal water , in our comfortable coco-mat apartment AA5R 157 , you will have the best relax time ..